A practical floor box designed for wood stage floors and computer floors. audio, video, power or telecommunication connections. 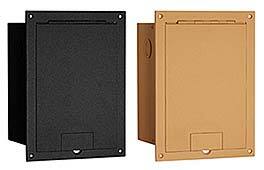 Includes 3 different mount plates, including 1 blank for custom configuration by Clark or contractor. The cover utilizes a dual door design that allows full access when making connections. Once connections are made, the door closes and the cables exit through the small cable opening. As a safety feature, the cable access door is closed when the box is not in use. is a one piece, all welded design providing both strength and simple installation.